Headache after Electric Shock Sensation: What to Do? Headache, as a symptom, has been associated with hundreds of different medical conditions, such as meningitis or sinusitis. However, most headaches are not signs of any illness, but can be related to certain lifestyle factors, like alcohol, lack of sleep, stress, or being hungry. Some women, especially those who are going through hormonal changes during menopause, might experience particularly unpleasant sensations of electric shocks in the brain followed by a headache. In others, an electric-like shock in the head precede a severe episode of migraine. 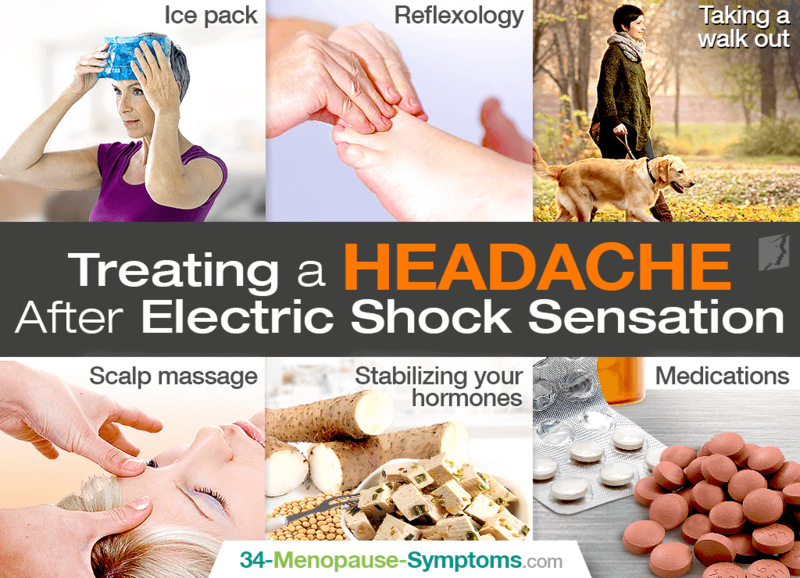 Fortunately, there are effective ways to handle a headache after electric shock sensation. It can improve your brain function and emotional state, making your less prone to stress and anxiety, which are known to cause head electric shocks and headaches. Such as smoking or alcohol, which can cause nerve damage, resulting in electric shocks in the head, controlling them can be beneficial in preventing headaches. Caffeine can also trigger headaches. With foods, dietary supplements, and proper water intake can ensure that your brain is getting the nutrients, like omega-3 fatty acids, magnesium, and vitamin B12, necessary for its proper function. It can trigger the release of natural pain-relievers, endorphins, strengthen your nervous system, and make you less susceptible to experiencing electric shocks and pain in the head. Meditating and learning breathing techniques can help you reduce stress and promote a sense of calmness, thus preventing it from causing electric shocks and aches in the head. Ice pack or cold towel on in the head for 15 minutes can alleviate headaches and reduce the built-up tension. Reflexology, which is a traditional Chinese medicine practice of massing several points on the feet and hands to relieve headaches. There are four points on the feet associated with pain in the head. Taking a walk out in the fresh air can relieve tension in your head, give you a boost of oxygen, and distract you from the pain. Scalp massage has been shown to alleviate tension in the head and increase circulation, but in some women, touching their head when it hurts can worsen the pain. Stabilizing your hormones. With phytoestrogenic and hormone-regulating herbal supplements can reduce the occurrence of electric shocks and subsequent headaches. Medications, most commonly the over-the-counter acetaminophen, aspirin, or ibuprofen can effectively relieve headaches. In case of more severe headaches, your doctor might consider prescription pain-relievers. Although most electric-like shocks and headaches are not dangerous, let your doctor know when they occur to ensure they do not signal a more serious condition. Most menopausal women report that having a consistent daily routine, related to meals time, exercising, and sleeping, improves headaches followed by electric-like shocks. Diet and alternative remedies can be effective, but they are not an overnight fix, so they have to be maintained for longer periods of time. If you want to grasp a better understanding of an electric shock feeling, take a look at the answers to the most frequently asked questions.